After seeing such a highly-skilled play by Alexander Semin in real-time. My initial reaction was: How can someone with so much skill only have four goals on the season? Semin possesses the ability to change the outcome of a hockey game; and that’s exactly what happened Sunday. The Edmonton Oilers were in firm control of this matinee contest, up 3-0 in the second, until this incredible play woke up the entire Carolina Hurricanes bench. The Storm Squad had a lot to cheer about after that.The Carolina Hurricanes scored six consecutive goals in a span of 17:27, overcoming the three-goal deficit, and Elias Lindholm had his first career hat trick in a 7-4 victory. Lindholm finished with a career-high five points. In my opinion, this was the worst game of the year for the Edmonton Oilers, who got maximum effort from their top players. 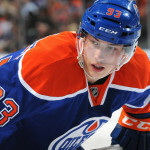 Ryan Nugent- Hopkins netted his second career hat trick in what was a four-point night. 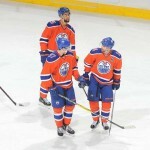 Jordan Eberle played a big role as well, racking up three points. These two players have been the leaders in Edmonton all season long, (despite still underachieving in my eyes). It is really disappointing when you get that type of effort and still lose a hockey game. Time for the rest of the team to follow the leaders, or get out of town. Let’s get back to Alexander Semin for a minute: This is a seven-time 20 goal scorer who has shown the ability to score 40, in the past. This season alone, Semin has been benched more than 12 times. Which is exactly why, I am not a big fan of long-term contracts. Semin is earning $7 million guarantee for the next eight seasons. This gives him very little incentive to produce at a high level on a consistent basis especially when things are going bad, as they are in Carolina right now. This brings me to my next point, as good as the drafted core has been.They could be better. Maybe paying them big money too early in their careers has something to do with the downfall of the team? This afternoon, however, the effort was all there from the big boys, and the team still managed to find a way to lose. I know it has a real negative effect on the fans. you can almost guarantee Edmonton will give up the lead. So, I can’t imagine what the attitude is in the locker room. 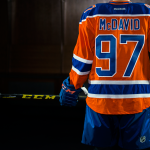 There is absolutely no way any hockey team should lose in the fashion Edmonton lost this afternoon. Especially, considering, the Carolina Hurricanes are in an equal dire situation in terms of the direction of their franchise. It is hard to believe what has happened to these two organizations since the 2006 Stanley Cup Final.